We looked at all the science and maths behind what we see with specific reference to the trails and came up with this list based on our observations, research and investigations. It has to be said that we have not proved some of these points conclusively yet, but we have tried to confirm them as far as we can, and have not managed to disprove them, and neither has anyone else as yet so they are relatively sound. When we presented this evidence to Dr. Mark Lawrence, Scientific Director of the IASS, at the Berlin Climate Engineering Conference 2014 he was unable to challenge anything there and then, apart from suggesting that some of the cloud types we showed and described could be explained by natural processes. We invited him and the other scientists in the room to meet us and justify their claim, but of course they never did. We hope this list will be of use to anyone who is out there struggling to convince people of this phenomena. We see planes leaving trails as low as 16,000ft. MET Office data originally stated – in an email from 2013 – that natural contrails can only form below -57 Celsius, and so above 37,000ft. The fact that -57 Celsius is only present at approximately that altitude is borne out by their very own Radiosonde data as shown in the image below. This image shows the correlation between temperature and altitude as shown by Radiosonde experiments. A temperature of -57 Celsius is only reached when approaching an altitude of 11.5km, which equates to around 37,00ft as we have always claimed. The above image was taken from the this document published by The MET Office. Despite this, since we started to confront them on the persistent trails in our skies, they have revised that figure several times. initially it went to 45,00ft then 30,000ft and then to 26,000ft and now it is even sometimes quoted as low as 20,000ft, which is clearly nonsense. If we assume a ground temperature of 10 Celsius, then divide 37,000ft by 67 (+10 to -57) we arrive at a figure of 1.8 Celsius per 1000ft decrease in temperature. This is simplistic of course and linear but the basic maths is clear. So when we see an aircraft at an altitude of only 16,000ft leaving persistent trails on a summer’s day we know it cannot be ice crystals. Let’s do the maths. Assuming a ground temperature of 20 Celsius, 16 x 1.8 = 28.8. 20 Celsius – 28.8 Celsius gives us -8.8 degrees Celsius give or take a degree or two. Obviously when we realise we are dealing with these types of temperatures then we know their explanations are nonsense. If what they say was true anyone working in an industrial freezer factory would be surrounded in persistent clouds from their breath lol. A simple experiment would be to boil a kettle inside a freezer storage unit, which tend to be kept around -20 to -50 Celsius. Watch as the water vapour just disappears before your very eyes. The image below is a regular sight over London. Lufthansa, one of the most prolific sprayers over the UK, regularly flies over London at altitudes as low as 16,000ft leaving very heavy trails. This image was taken over London and is an Airbus A321 flying at around 18,000 – 20,000ft, far too low to be leaving any natural contrail. Using the maths above (it was summer) we can estimate the temperature at 20,000ft to be -16 Celsius. Often planes are seen in the same area of sky, one leaving a long trail, another leaving a short trail, and another leaving no trail at all. We termed this OWOW – One With, One Without. This is, quite obviously, impossible, especially when we consider that most aircraft now use the same turbofan engines from either Rolls Royce or Pratt and Whitney. Both use the same technology and so the emissions are pretty much the same from every plane. 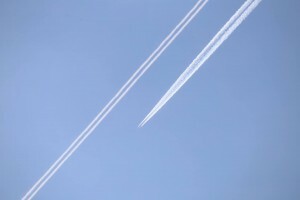 In other similar examples we regularly see 2 planes traveling across an entire sky leaving completely different trails. We call this combination therapy and it derives from the need to spray different chemicals that cannot be pre-mixed on the aircraft or sprayed simultaneously from the same source. We do not yet understand why as we have no idea what substances are being sprayed. It is of course possible that this is simply an attempt to hide the fact that the trails look different. It seems to be the case that various substances need to be sprayed simultaneously to form cloud-like cover, and we know that our efforts to expose the different looking trails have forced their hand and resulted in efforts to try to disguise the different looking trails. The forward aircraft is still just in the frame. Similar to the above but this is combination therapy on a single 4-engined aircraft. We see different looking trails from separate engines on the same plane. Again this is a complete impossibility. Combination therapy, as we refer to it, used to be common practice even from twin-engined jets but we have seen less and less over the past 3 years as the public have started to look up and question what they see. Obviously a plane that leaves different trails from different engines also leaves no room for doubt that something is being added to the trails to make them visible and persist. The above image is a common site. 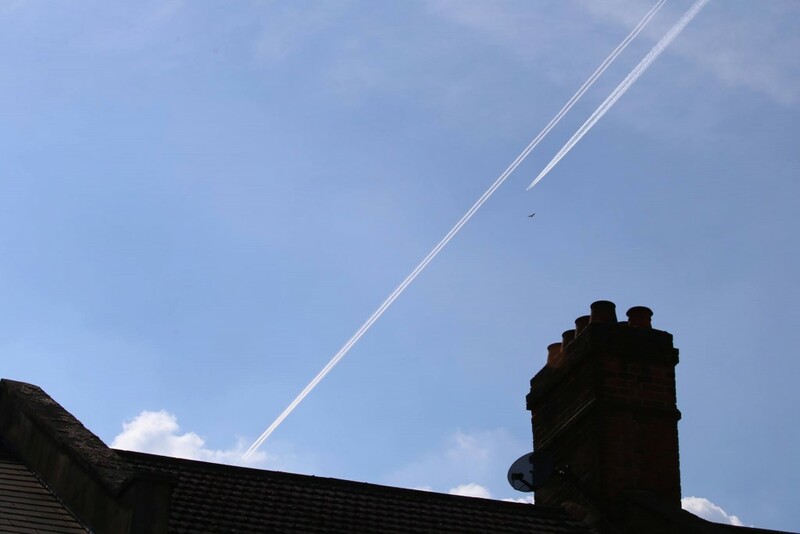 Lufthansa are the biggest polluter of UK skies at the moment, with their transatlantic flights regularly seen producing 2 types of trails in whatever conditions they happen to be flying. Another inconsistency is that we see all of the above on any particular day, irrespective of atmospheric conditions. 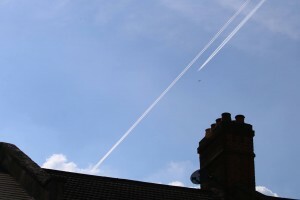 It is stated in official disinformation such as this, issued by the The MET Office, and this, issued by the Department of Transport, that contrail formation is essentially dependent on temperature (and subsequently altitude) and humidity. Despite this we see planes leaving no trails and leaving all manner of trails on any given day whatever the conditions, summer or winter and at altitudes as low as 16,000ft, recorded in January 2015 over London. One does not need to be an atmospheric scientist to work out that this makes no sense at all and the ridiculous attempts by the authorities to try to explain away what we see simply implicates them as utterly complicit. If these trails were real and dependent on these variables then we would see clear and consistent patterns, with all aircraft leaving similar trails on similar days, and no trails at all on summer days, especially at low altitudes. But we don’t. Instead we see our skies are a mess of all sorts of different, random trails at all altitudes, with no identifiable pattern to the them whatsoever. 4. Some trails are thick black smoke. How can that be water vapour ? There are no conditions that can make a jet engine produce black trails. This is the most compelling evidence of spraying to date and utterly incontrovertible. Point people towards our Smokers film to see this in its full glory. www.vimeo.com/88080046. In this image we see a Thai Air Airbus A380 and a Condor Airbus A32o or A321. We spoke to Rolls Royce and they stated very clearly in a recorded telephone conversation that all of their new engines are as clean as a whistle now due to stringent EU emissions regulations so there is no way that they could produce a visible trail of any kind. Interestingly when we spoke to the news desk at the Daily Mail, they refused to publish these images or the film because they claimed the planes ‘were on fire’. When we pointed out that there was more than 20 planes in the film and they could not all be on fire, they refused to comment further. As always we have the conversation recorded. Anyone who is not alarmed by this film really needs to think again because there is no reason for commercial aircraft to be pumping thick black smoke into our skies. Now fitted to all large passenger jets including the Airbus A320 and A380s (the ones that leave the persistent trails) and also on all new Boeing aircraft, use fans for thrust, not the combustion exhaust, and so produce much less moisture. This means they are very unlikely to leave any trail at all even under ideal conditions. Read more on Wikipedia. This is the only slightly tenuous one. There is almost no gap between the engine and the tip of the trail. Moisture cannot condense from 900 Celsius (the apparent temperature of exhaust gases from a jet) to -57 Celsius in 2-4ms. When speaking at the Cambridge SRM Symposium someone claiming to be an aircraft engineer pointed out that with High Bypass Turbofan engines, a large percentage of the air exiting the rear is un-combusted and so at ambient temperature, so we are trying to look further into this one, but it still seems highly unlikely the very small percentage of combusted gases would condense that quickly anyway even in idea conditions. We have yet to have this scientifically proven, but from the few scientifically qualified people we have spoken to, we seem to agree that it is extremely unlikely to be able to cool that fast under those conditions. When considered in combination with the twin plume evidence, then we have a pretty solid case we feel. We often see more than one plume coming from each engine and pylon. Impossible if this were just condensation from the exhaust. The first image below shows 2 distinct plumes emanating from both the engine and the pylon. It is unclear if additives to the fuel are also used to enhance the cloud forming properties of the exhaust, but the important thing to consider in this image is the fact that it sows quite concisely that the trails we see are not just condensing moisture from combusted jet fuel, but are in fact the result of substances unknown being added to the exhaust and possibly the fuel also. The next image is an even more obvious example with 2 plumes emanating from each of the 4 engines, particularly obvious on the far engines. Emirates Airbus A380 displaying the give-away twin plume phenomena on each engine and pylon. Exhaust moisture cannot increase in volume over time. It should disperse quickly even under ideal conditions. Despite this we see trails spreading over huge areas, effectively forming a type of cloud. The exhaust of any modern jet engine cannot, under any atmospheric circumstances, produce clouds unless something is added to it via the fuel or by being injected into the exhaust plume. Despite this fact, on most days the trails over populated areas of the UK are so dense that the fake clouds they produce can completely define our daily weather and cover our skies in a grey ‘blanket’ from horizon to horizon. If it were natural for planes to make clouds and they had always done so, they would be mentioned in the weather forecast, but they never have been. In fact, the MET Office completely denied, until quite recently, that planes could make clouds at all. Maybe they were hoping we were not going to notice? Oh dear, sorry guys, but we did. Since we have been making such a fuss about this, they released a new (dis)information leaflet which describes all the new aviation derived cloud types. It is very informative except for one rather crucial thing. There is no mentions of the fact that almost every cloud type mentioned is produced by emissions from aircraft. Hmmm, funny that. What are they scared of ? Surely if this is all natural, as they claim, there is nothing to be worried about. 10. ONLY MODIFIED AIRCRAFT PRODUCE TRAILS. This really is the silver bullet. 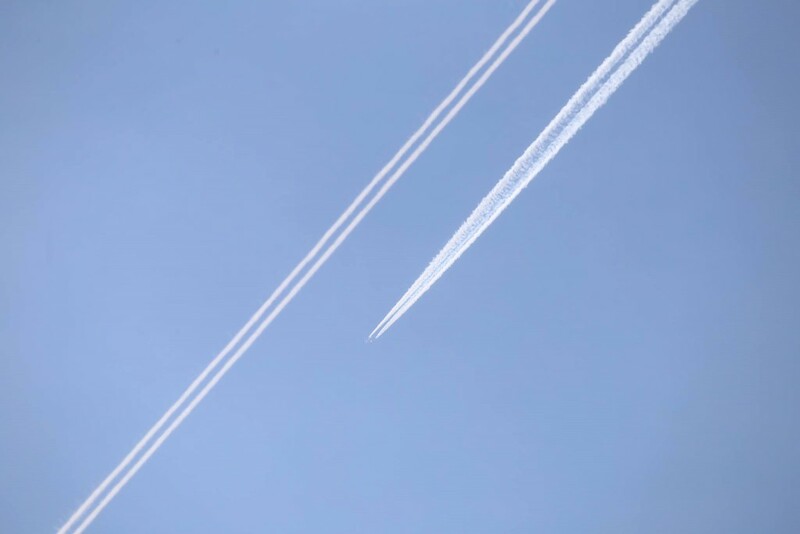 All planes that are seen leaving the various types of persistent trails have been modified with the 3-pipe aerosol delivery systems. We expand on this on our A320 delivery systems page. It is important to point out here that the 10 points above refer specifically to the trails themselves. There are a myriad of other things we can point to which prove that active Climate Engineering programs are in full swing, such as aircraft behaviour patterns, the complex, establishment disinformation campaign that is also underway to try to convince people everything is normal, the testimony of several high-profile people who have spoken out about the programs such as Ted Gunderson – former head of the CIA – the many patents registered for Climate Engineering technology relating specifically to aerosol delivery systems on planes, the assorted laboratory results collated around the world showing higher than expected levels of the chemicals generally accepted as being associated with this technology, the records showing progressive global dimming since at least 1985, new atmospheric phenomena being reported almost on a monthly basis and the MET Office’s attempts to explain them by releasing new names for those phenomena that did not exist 15 years ago such as Parhelion, Mammatus Clouds and Diamond Dust to name but a few. The list goes on and on. It could legitimately be argued that much of this type of evidence is circumstantial and inconclusive when viewed individually, and we have to admit we do not have the time or the financial resources to investigate each point to its ultimate conclusion, but when we look at the bigger picture we see what could be described as a conjectural focal point. We now have so many strong lines of conjecture that all seem to point to the same thing. Collectively, it is reasonable to claim that they confirm, beyond reasonable doubt, that our weather is being modified by commercial aircraft. Certainly the above list is very hard to disprove so the rest becomes almost irrelevant. It really does not matter why, it simply has to stop. We have not been asked or informed and it is illegal, immoral and very likely harmful. To call it an unacceptable situations would be a massive understatement. This is an utter outrage and we must put an end to it as soon as we are able.